The Conversationalist’s Café. Photo courtesy of Taylor Baldry. Taylor Baldry wants to put conversation at the center of the dining experience. Or rather, Baldry is really only concerned with conversation, hold the food. 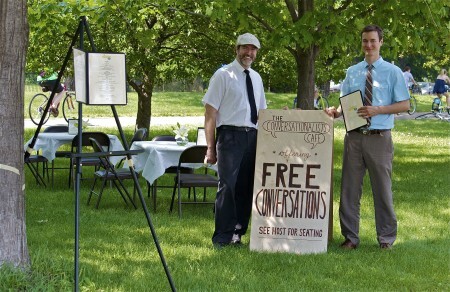 Baldry and conversationalist-in-crime Wayne Fuller will be at Open Field this summer serving conversation topics on printed menus and hosting passersby to an evening of tasty conversation at The Conversationalist’s Café. Baldry first conceived of this project after living abroad for two years as a way to spark witty banter and meaningful conversation with strangers in Minneapolis in an age riddled with digital distance. Interested in face-to-face communication rather than social media, Baldry has set out on a mission to bring back the antiquated art of conversation. Not only does Baldry envisage the project as art of social engagement, but he also sees the project as a practical lesson and tool for those who want to hone their conversational skills. On his website, he offers talking tips for those interested; and his topics of conversation are widely approachable, light-hearted and designed to make you smile. 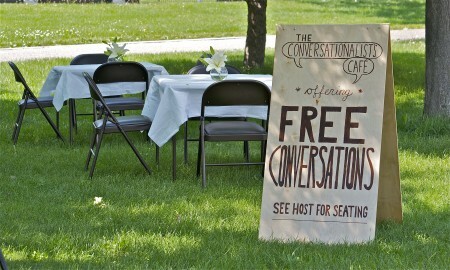 When The Conversationalist’s Café is not gracing Open Field, Baldry and Fuller can often be found at Lake Calhoun with their card tables, a menu of topics, and an earnest desire to strike up a good conversation among strangers; so keep your eyes peeled on the Conversationalist’s website for dates throughout town. The Conversationalist’s Café will hit Open Field on four Thursdays this summer: June 7th, July 5th, and August 2nd, from 5:00-8:00 pm. August 9th will be a special 1980’s-themed evening from 6:00 pm to 8:00 pm.